Let us help you celebrate St. Patrick’s Day in style… DD style, that is! We are excited to share our favorite ideas for eating, crafting, and celebrating your way through this lucky holiday. We spotteDD these lucky donuts on our Facebook page-- thank you to DD fan Vickie for submitting! 1. 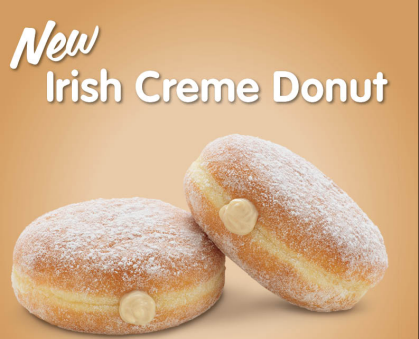 Irish eyes are smiling at our NEW Irish Creme Donuts! Keep running during St. Patrick’s Day with this festive donut that features a sugar raised shell, Irish Creme-flavored filling, and a sprinkle of powdered sugar. 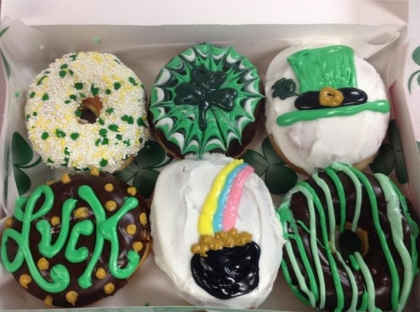 These donuts are leprechaun approveDD! 2. St. Patrick’s Day festivities are taking place across the globe, but there’s a special place in our heart for Boston, MA. In addition to being the hometown Dunkin’ Donuts, Boston is a city that is known for its Irish spirit. 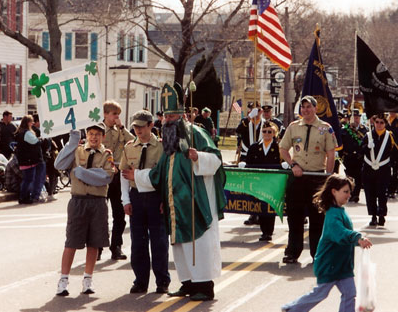 This year, DD will be holding a free sampling event at the Abington St. Patrick’s Day Parade in Abington, MA. 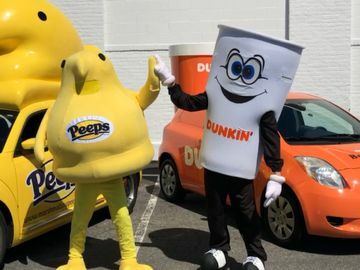 The parade begins at 1pm on March 17 at the corner or Orange Street and Washington Street in Abington Center. 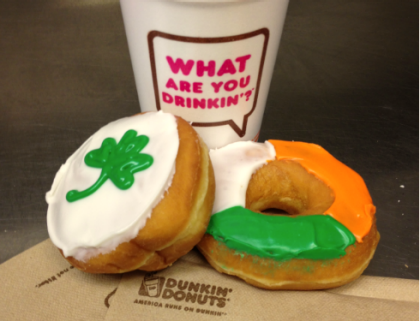 An Irish Creme Donut is the perfect complement to Irish music, dancing, and cheer! Take a look at the motley crew in Abington, MA in 2012! 3. As we all know, March weather tends to “go out like a lamb”—and that means it’s the beginning of iced coffee season! We have designed a simple and snug St. Patrick’s Day koozie to keep your DD iced coffee cold in warm spring temperatures. Check out our step-by-step guide here! 4. Get ready to test your luck on Twitter! 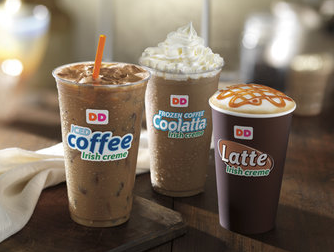 @DunkinDonuts is running the fan favorite #GooDDluck sweepstakes. We are asking one “lucky” question each day and giving followers the chance to win one of four $77 mGifts. The sweepstakes runs through Friday, March 15! 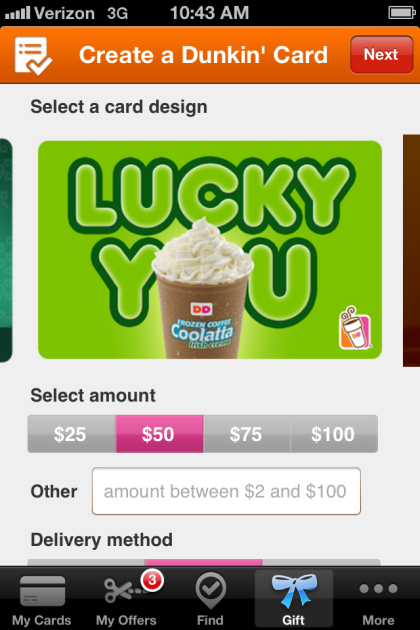 Even if you're not a winner, all DD fans can celebrate the season of St. Patrick's day year-round by adding or mGifting one of our St. Patrick's Day themed virtual DD cards to the Dunkin' App on their iPhone or Android. 5. Are you a DD coffee lover? Then you’re in luck! 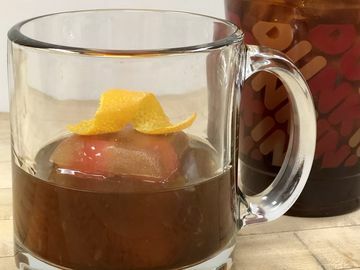 This year, we have introduced a full lineup of St. Patrick’s Day-inspired beverages, from hot and iced Irish Creme Coffee and Lattes to the Irish Creme Frozen Coolatta in participating markets. Be sure to treat yourself to this smooth and velvety flavor! 6. We want to make sure that all DD fans have a little pot of golDD at the end of their rainbow this year. To enjoy a delicious gift on us, download the Dunkin' Donuts Mobile app on your iPhone or Android. Right before you place your order at the DD counter, tap the “My Offers” tab to receive $1 off a 50-count box of Munchkin® donut hole treats or two muffins for $2. Don't have the Dunkin' App? Click here to get it on your iPhone or Android. 7. 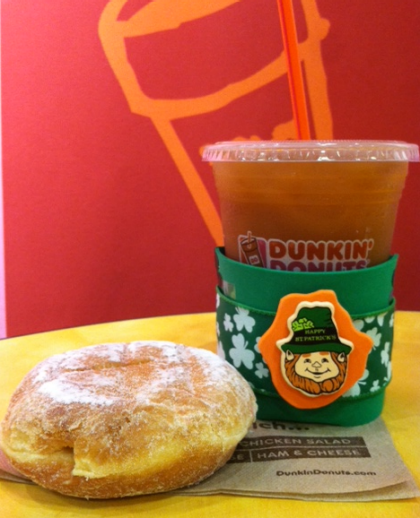 If your eyes are already peeled for leprechauns, you may also experience a special DDonut sighting! 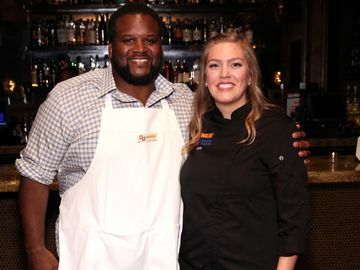 Our local restaurant managers are cooking up creative donuts for St. Patrick’s Day. Check out this design from Milford, Connecticut. 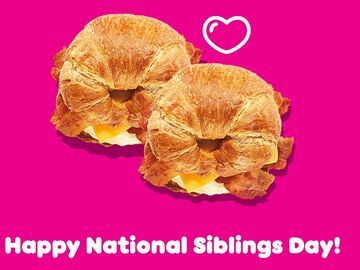 To see if there are any fun donuts available near you, visit your local Dunkin Donuts Facebook page. 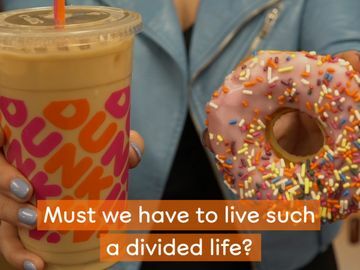 Do you have any ideas for celebrating with Dunkin’? Share them on our Facebook or Twitter page! Happy St. Patrick's Day!